Comprehensive cable tester used to diagnose wiring faults for 10BASE2 (Coax), 10BASE-T, and 100BASE-Tx, TIA-586A, TIA-568B & Token Ring cables. Identify wiring faults such as open wires, shorts, reversed pairs, crossed pairs, split pairs and mis-wiring. Identify up to 4 different cables from the tested end. 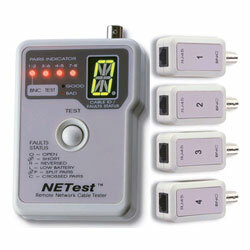 With a push of a button, the NETest will automatically scan all wires and pairs to determine any existent faults. A large alphanumeric LED displays the fault code; while a series of smaller LEDs indicate which pair the fault is existent on. For testing of installed cables, 4 remote terminators are provided. The terminators are also used to identify which cable is being tested. Makes cable testing for multiple LAN interfaces virtually effortless.